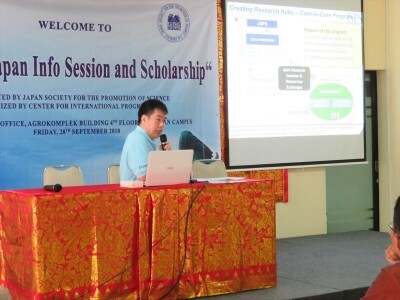 On 28 September 2018, the JSPS Bangkok Office organized JSPS guidance seminar at Udayana University in Bali, Indonesia. Udayana University, founded in 1962, is known as the first university in Bali. Currently about 30,000 students including 1,500 international students are learning in various 13 faculties. JSPS Guidance seminar was kicked off with the opening remarks from Mr. 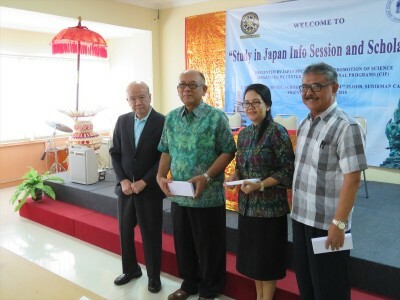 I Kut Tika (Secretary of Center for International Programs), and Director Prof. Yamashita introduced the summary of JSPS including its overseas offices and JSPS Alumni Association of Indonesia (JAAI). Afterward, Mr. Tomiyama, Deputy Director and Mr. Niihara, International Program Associate presented JSPS international programs. As former JSPS fellow speakers, we welcomed Dr. Anak Agung Ayu Mirah Adhi (Professor, Laboratory of Veterinary Pathology, Faculty of Veterinary, RONPAKU program) and Dr. I Gede Putu Wirawan (Professor, Integrated Lab of Bioscience and Biotechnology, Postdoctoral Fellowship). We appreciate two wonderful speakers for sharing their past experience in Japan. 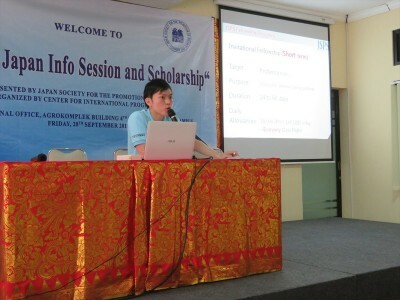 This guidance seminar was attended by about 100 participants, mostly undergraduate and graduate students. 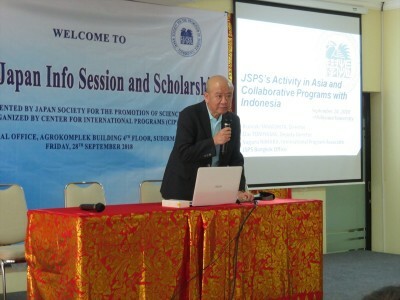 We hope many Indonesian researchers utilize JSPS programs to promote interaction between two countries.